Region: This Caterpillar is found in northern United States and southern Canada. Life cycle: This insect produces one generation each year and hibernates as adults in protected areas close to the orchard. 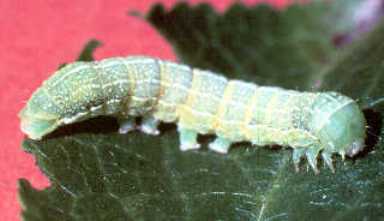 Physical Description: This 1-inch long plump caterpillar is light green with a stripe on the sides and a brown head. The adult moth is gray or purple with darker mottling and a wingspan of about 1 1/2 inches. The eggs are laid in early spring on the branches of the host plants. This caterpillar is very similar to the Pyramidal Fruitworm. Feeding characteristics: This pest attacks apple, cherry, peach, pear, plum, and quince plants by chewing leaves and boring into green fruits, causing shallow cavities to form. The fruit may drop off, but overall injury to the plant is minimal. The fruit quickly heals. Controls: handpicking is usually sufficient to control this pest, but if damage is intolerable, apply Bacillus thuringiensis.